You can use the domain rename process to change the names of your domains, and you can also use it to change the structure of the domain trees in your forest. 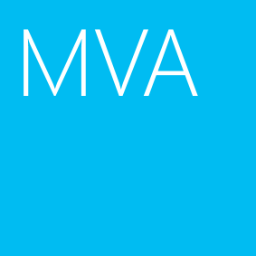 Before renaming the domain, you need to create the application directory and the service record for the new domain. 2. Click "Start > Run", enter "dnsmgmt.msc". 3. At DNS console, expand "DC1 > Forward Lookup Zones". 4. Right-click "Forward Lookup Zones", select "New Zone". 5. At welcome screen, click "Next". 6. Select "Primary zone" and check "Store the zone in Active Directory...". 8. 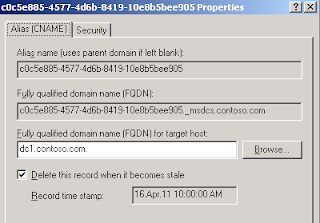 Select "To all DNS servers in the Active Directory domain: Contoso.com". 10. Next to "Zone anme", type "fabrikam.com", click "Next". 11. Select "Allow only secure dynamic updates (recommended for Active Directory)", click "Next". 13. 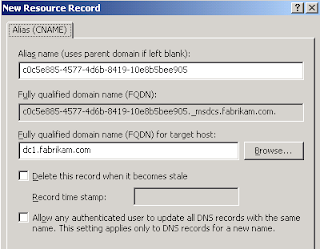 Right-click "fabrikam.com", select "Other New Records". 14. 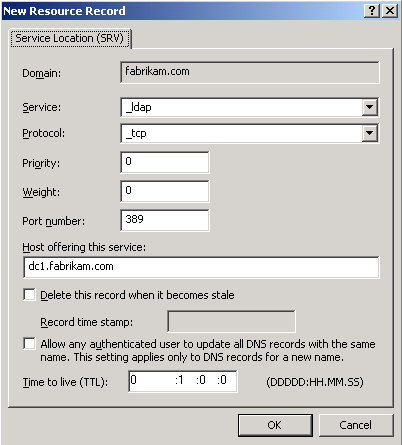 Select "Service Location (SRV)", click "Create Record". 18. Right-click "Forward Lookup Zones", select "New Zone". 19. At welcome screen, click "Next". 20. Select "Primary zone" and check "Store the zone in Active Directory...", click "Next". 21. 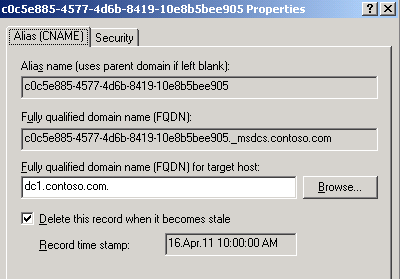 Select "To all DNS servers in the Active Directory forest: Contoso.com", click "Next". 22. Next to "Zone name", type "_msdcs.fabrikam.com", click "Next". 23. Select "Allow only secure dynamic updates (recommended for Active Directory)", click "Next". 25. At left pane, select "_msdcs.contoso.com". 26. Double-click "the alias record of dc1.contoso.com". 27. Copy the "Alias name", click "Cancel". 28. 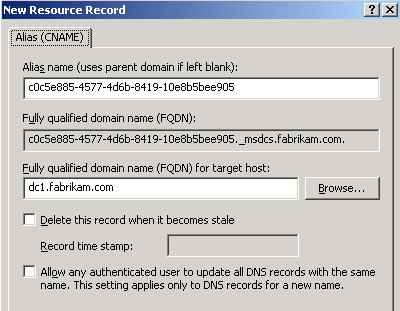 Right-click "_msdcs.fabrikam.com", select "New Alias (CNAME)". 29. Paste the Alias name in "Alias name" filed. 30. Next to "Fully qualified domain name (FQDN) for target host", type "dc1.fabrikam.com". 32. Click "Start > Command Prompt". 33. Enter "repadmin /syncall /AedPq"